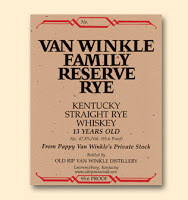 Pappy Van Winkle and Buffalo Trace Antique Collection is just a few months away. I wanted to repost this as many people start to ask and we do not want people to be blind sided when Pappy is released and they did not know about our WRC. This will be the only way to receive Pappy Van Winkle, the Orphan Barrels, Four Roses Limited Releases, Old Forester Birthday Bourbon, Buffalo Trace Antique Collection, Old Fitzgerald, limited Japanese Whiskey, and so on with other rare whiskeys. How do I get Pappy Van Winkle and BTAC? The only way to get Pappy Van Winkle and Buffalo Trace Antique Collection is through our Whiskey Reward Club and we use a weighted raffle (more about this below). This release is based on 12 months purchases. The 12 months prior to this year's release. We will announce the cut off date as we get closer. As you may know, many people come out of the woodwork this time of year just looking for Pappy, but we want to reward people that have supported us all year long. Weighted raffle - We base the allocations of Pappy Van Winkle on the previous 12 months. Release of these bottles will be based on your total purchases: wine, liquor, beer, cheese, nuts...everything in the store. The releases will still be a weighted raffle. The more you spend the better chance you will have as you will get more raffle tickets for each release. We take half of our allocation and that goes to the top of the list and the other half we use a weighted raffle. For every $600 dollars you spend, you will get a ticket in the lottery (basically spending an average of $50 per month). If you spend $1200 over the course of the year, you will get 2 tickets and so on. We will post updates when whiskey is coming and when allocation emails have been sent. You will get an email if you get an allocated whiskey, you have 7 days to pick up or we will draw another name. There is no fee to sign up, it is free to join. How do I get Pappy Van Winkle? The only way to get Pappy Van Winkle is through our Whiskey Reward Club. How do I get other rare whiskey (non Pappy and BTAC)? Through our WRC + random bottles will appear on the shelf without notice. The Pappy Van Winkle Raffle will include other limited releases that come in between now and the raffle too. Plus we do numerous other raffles throughout the year. We will announce when we have a raffle and which bourbons will be involved. Recently we just released our own barrel of Blanton's Bourbon this way. The non Pappy raffles are based on 6 months previous purchases at the time of the raffle. We have decided that for every 300 dollars you spend over the course of the 6 months prior to a release (an average $50 per month) you will get one raffle ticket in the lottery. If you spend $800 we will divide by $300 and round (800/300= 2.67, so you would get 3 tickets in the weighted raffle). We still take half of our allocation and that goes to the top of the list of WRC and the rest is used for the weighted raffle. I signed up for the WRC, but I have not received any emails about rare bottles of Whiskey? We do not always send out offerings to the whole list, only people whose name was drawn in the weighted raffle get emails informing them that they received a bottle. Can I retro my previous sales if I just signed up? No, sorry there is no fair way to do this. We have been advertising on our blog, emails, twitter, facebook for years now about the WRC to sign up and telling people that this is how rare releases will be sold. What are my chances on rare bottles of whiskey? We do not want to give false hopes. Many releases we get 6 bottles or less, the odds still are not great. We have thousands of people in our WRC program now. This is why we started the WRC, how do you decide who gets these 6 bottles of rare whiskey out of thousands of customers at all of our locations. We are just trying to be as fair as possible. What counts towards the WRC in my purchases? Everything you purchase counts: wine, beer, whiskey, tequila, cheese, soda, nuts....everything in our store will count. Guidelines are subject to change. We will evolve the system to make it better based on customer comments and when we see fit. We will always give notice when we adjust the guidelines.